1st XI Cuparrow-rightCreated with Sketch. OEs headed to the beautiful setting of Clarence Park to face St Alban’s CC in the second round of the County Trophy looking to start another successful cup run. In a break from the norm, Saqi won the toss and elected to bat on a flat deck with what looked a fast outfield. Kazi joined Jimmy at the top of the order in a new look opening partnership that started well, adding 35 off the first 6 overs. Jimmy fell in the seventh over and number 3 Shaun fell in the ninth over to the excellent lines of opening bowler D Rossen. At 47-2, Scutt joined Kazi and the pair added 81 for the third wicket, but this was broken in the first over after drinks as Scutt was given out for a well-made 29. A further 25 was added to the score before Kazi played a pull shot that was superbly caught at mid-wicket, to end another wonderful knock on 88 when he looked destined for a century. 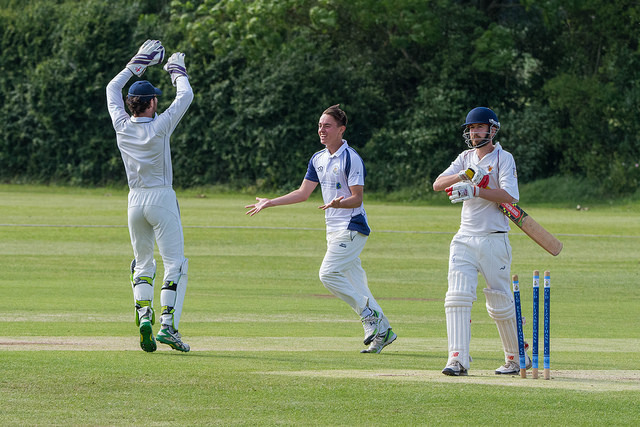 With the score on 153-4 in the 35th over, OEs had a platform to attack the last 15 overs. Although Jimmy Mich (9) & Kails (6) fell cheaply, Tush (28), Buzzer (32*) & Saqi (25*) helped steer us to 256-7, adding 29 off the final 13 deliveries. To match the settings, we had a lovely tea in the pavilion which dates back to 1898 which no doubt helped inspire the bowlers as they looked to defend a target of 257. The opening spell from Anish (3-18) & Busby (1-22) all but secured our passage into the next round, their combined 12 overs reduced St Albans to 35-4. They were ably backed up by the pace of Gomes (1-33) and guile of Jimmy Mich (1-24). If the bowling wasn’t enough, then the fielding was excellent, typified by a superb run out by Buzzer. J Rossen drove the ball towards extra-cover and immediately set off what looked like a certain 1 if not more, but he hadn’t banked on Busby making a full-length dive to his right, collecting the ball cleanly before rolling over and throwing down the only stump visible from his angle, Rossen was barely in the frame from this magnificent piece of skill. There was resistance from the St Albans 9th wicket as they added 74, but this partnership was ended and so was the innings as both Jimmy Heavey & Saqi picked up a wicket each to secure a 109-run win. OEs face Watford Town in the next round which is expected to be played on Sunday 15th July. Old Elizabethans CC (Barnet) won the toss and decided to bat.